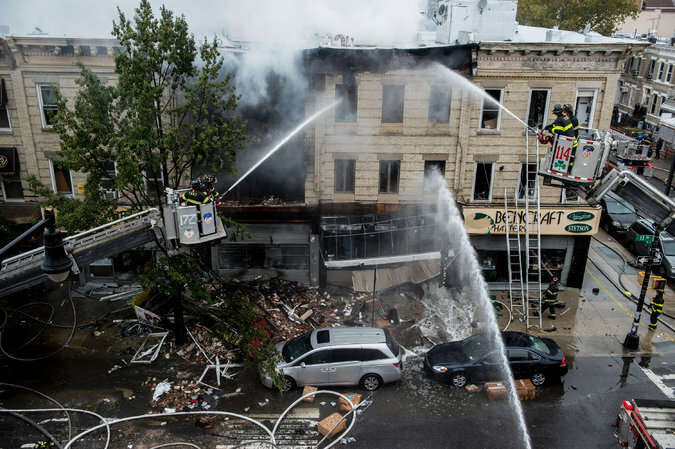 The removal of a stove may have sparked a massive gas explosion that tore the front off a Borough Park building and left one woman dead, three people injured, and one resident missing on Saturday, Oct. 3, officials said. With the wreckage marring the Borough Park street, police were still searching early Sundayfor another resident who was missing. Fire Commissioner Daniel Nigro said the gas leak that triggered the deadly blast may have been caused when second-floor tenants of the 13th Ave. building near 42nd Street recently moved. "They were moving out of the apartment and wanted to take that stove with them," Nigro said at a Saturday afternoon news conference. "(Taking) a stove with you entails disconnecting the gas line which leads us to look in that direction for the cause of this explosion." The force of the explosion left behind a hollowed-out shell along a string of aluminum-sided, three-story buildings. "The front of this building was blown out into the street," Nigro said. "We have not yet been in that building because of the structural damage." The burned body of a woman, believed to be a Dominican immigrant in her 60s who lived on the third floor, was found on the building stairwell, officials said. A 34-year-old man, his 9-year-old son, and a 27-year-old man were caught in the storm of debris. They were rushed to New York Methodist Hospital with minor injuries to their legs. "It was a tough day here in Borough Park," said Mayor de Blasio as he returned on Saturday to a community he once represented in the City Council. "This is a tragedy because we know that we have lost one person. It is also the Sabbath day. I know it was a real shock to the residents of this community to hear this explosion." Shell-shocked neighbors said a menacing black plume of smoke descended on the street as the fire ripped through the building that once held the "Pots N Watts" appliance store. "It was dark ... like night," said 11-year-old Roza Arafa Chowdhury, recalling the moments after the 1:05 p.m. blast. "A guy was trying to take his father (away from the scene) but the fire was too big and they were burned." Five out of the more than 200 firefighters who responded to the scene suffered minor injuries, Nigro said. Salvadore Toree, who lives next door to the doomed building, had just gotten into his friend's car when he heard the blast. "We got out and saw smoke and glass everywhere," he told The News, speaking in Spanish. "I thought about my family. The flames were huge and I was scared that the building could collapse." His building wasn't damaged but the one next door was consumed in flames, he said. Panicking, he ran up to his third-floor apartment and told his wife, two daughters and son that everyone had to leave. "They left with nothing ... without shoes," he said. "I was afraid something else would explode. Thank G-d we're OK."
"We heard like the floor shake and like there was a big explosion. We just grabbed everything, my uncles, everything. We grabbed everybody and just left out," said anotherwitness at the scene. "I see a man who was hopping on one leg. And I think he got injured because something fell down. And so then I didn't know what to do because I was with my little sister so I was like, 'Let's go! let's go! We can't be here,'" said another witness. The city's Office of Emergency Management's twitter account is advising people to avoid the area. The city Department of Buildings says staffers are also on the way to assess the damage. In a statement, Governor Andrew Cuomo said the State Department of Public Service will conduct an investigation into the cause of the explosion.